After a cold and rainy first half of June, it is finally so hot in Michigan that the kids are spending a good portion of each day in their bathing suits. But when Juniper isn't wearing a bathing suit, she is wearing a sundress. 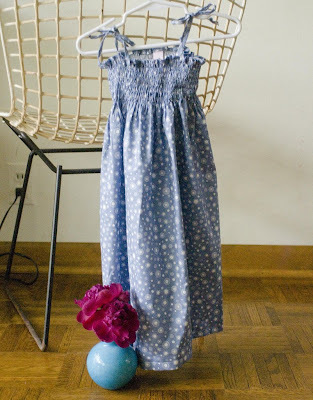 You can sew a girls' sundress in a little over an hour, making it a ridiculously easy project perfect for this weather (it's always better to be outside than cooped up behind a sewing machine). I've been using a pattern from Heather Ross' book Weekend Sewing, and her instructions are also available on the Martha Stewart website. A note about smocking: Heather describes in her book and in the online instructions how to sew with elastic thread, and I tried it at least three different times on different days with different fabrics before I finally got it right. Once I figured it out, I was so thrilled I felt like smocking everything in sight. My children and the dog run away from me for fear of being smocked. To create smocking, hand wind elastic thread onto your bobbin without stretching it. Then put the bobbin in your machine, and make sure that you put the elastic thread through the thread slot in the bobbin compartment before you pull it up with your top thread. When you pull the elastic thread up, it will feel like it is pulled tight, and that's okay. The first few times I tried, I was so careful to make sure that the elastic thread didn't have any tension, that I didn't make sure it went through the thread slot, and when I sewed, the elastic thread was really loose and loopy and completely wrong. When you've got it right, your fabric will gather a little bit as you go. When you're finished sewing the lines across (I did 8 lines, 1/2 inch apart), spray the fabric with water and iron it on a very hot setting. 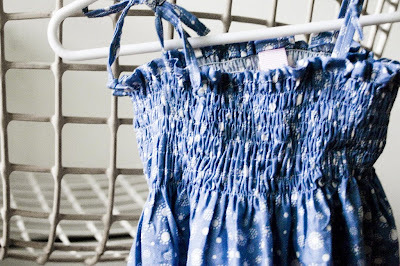 The smocked portion will shrink right up, just like magic. You might let out a little squeal, it's just that exciting. My favorite thing about making this dress for girls Juniper's size is that the 44'' width of most quilting fabrics is the perfect size, which means that you can use the whole width of the fabric, from selvedge to selvedge, and you don't have to finish the seam allowances. (Just like the oliver + s lazy days skirt pattern). I don't have a serger, and even though I've gotten pretty good at using a tight zig-zag to finish my seam allowances, I love it when I don't have to, and it gives the dress a professional quality that most of the things I make don't have. 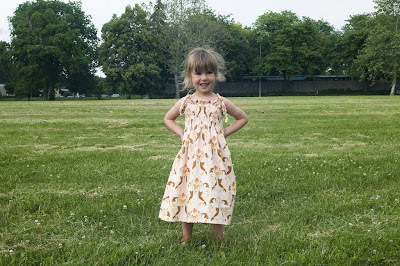 I made Juniper another dress just a few days ago, and I suspect I'll put together a few more before the summer is over. The ritual of sneaking into her room and hanging the dress on the back of her door while she is sleeping has become a tradition. That way, when she sneaks into our room in first thing in the morning I turn around to smile at the sight of her so happy already in her new dress, no matter how early it is. Can't wait to try it to add to my pillow case dresses. My heart literally started to flutter at this, the first explanation of smocking that has ever made sense to me. Also, the mother-daughter love might have something to do with it. Too sweet. I was going to make one sans smocking. The smocking terrifies me. EXCELLENT work, it is beautiful.